Working with tons of application here at Salesforce, I got a chance work with wide gamut of internal and externally exposed API's. Over the period of time, I developed a curl template, that I used in command prompt or Mac terminal to consume api in no time. I treat this template as my key resource to connect to Salesforce api's in matter of minutes and then move on writing code in more proper fashion for designing the client. Grab the Consumer Key and Consumer Secret after creating application, save them, before we move on. Now we can use these credentials to authenticate the api-user and get API Token, once we have API token the last step would be to access the API to pull data we want. Copy this code snippet shown below in sublime or your favorite text editor and replace with your login credentials (consumer key, consumer secret, username, password) and then paste the template on command prompt in mac terminal to receive the API token in the response from REST API. 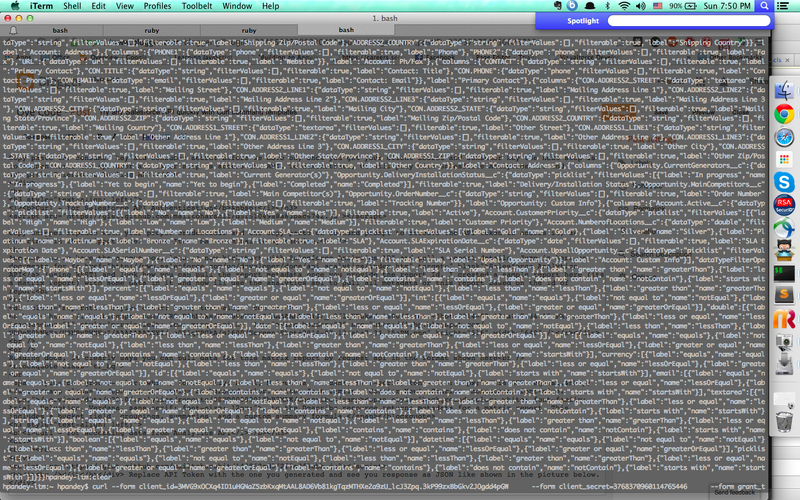 I used Iterm mac terminal in my machine. Once your post the request, then see if, the response you get after posting, matches with the one shown in this snippet here. How to get started with Salesforce Analytics API ? 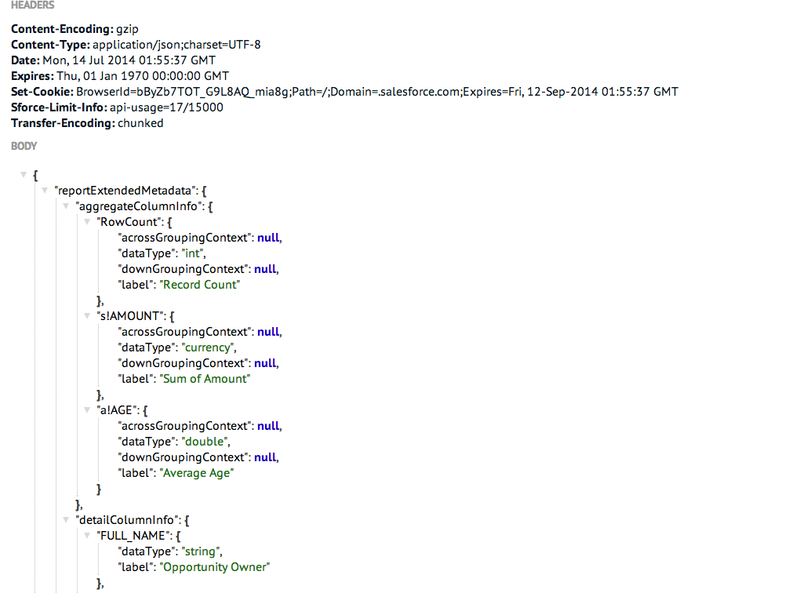 Jump in here on documents for Salesforce Analytics API (using REST) and have a look how you can pull the report metadata by providing the report Id. 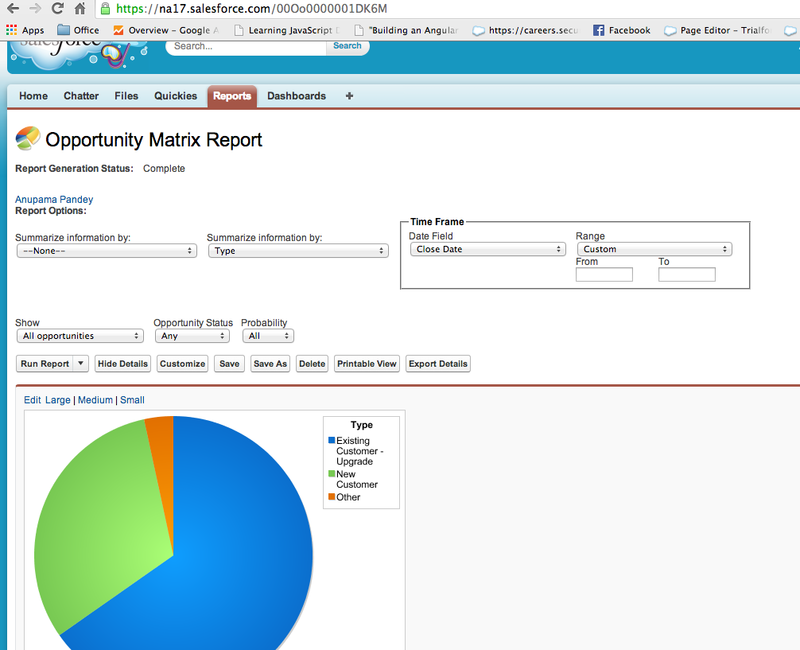 I created a matrix report on Opportunity and I'll use the report ID to pull metadata of this report. Remember the response would be in the JSON format. This GET request, /services/data/v29.0/analytics/reports/00OD0000001ZbP7MAK/describe, to the Describe resource returns metadata for a matrix report. This includes a bucket field, groupings, summaries, and a custom summary formula. Replace API Token with your token and run this command prompt again like I did here in the picture. Brilliant, we did it !! Now let us create new connected application to pull data from Salesforce Tooling API. Now, I am going to pull the 'list of all sobjects' but with tooling api. How to get started with Salesforce Tooling API ? 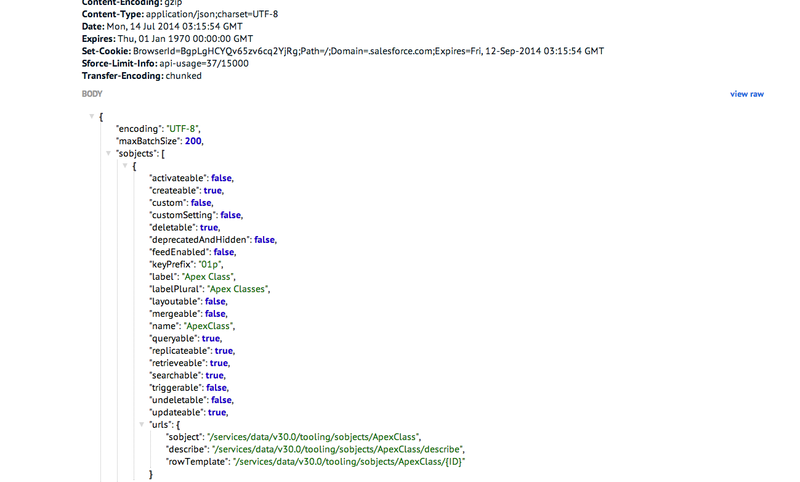 Lists the available Tooling API objects and their metadata. Sooner, I'll share the sample application I built on top of Salesforce that uses salesforce and remote objects to pull data plugging into API you needed. I hope this template will helpful for you in playing and spreading Salesforce API love all over world and among the community.